Great interactive session on how to always be Glam by the founders of Glam Studios, Sadiya Naseem and Darakhshan Husain. The Divas got professional, yet easily implementable solutions to all their beauty related woes. Venue: Renaissance Mumbai Convention Centre Hotel Beauty Pageants is your one stop destination for all that's happening in and around the world of glamour and beauty. 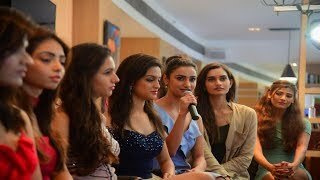 Get the latest news, views and interviews from beauty contests like Femina Miss India, Miss Diva, Mr India, Campus Princess, Fresh Face, Miss World, Miss Universe, Miss Earth, Miss International, Miss United Continents, Miss Supranational, Miss Grand International all under one roof. Check out all exclusive videos on this channel.